Finally a cover for my beloved sewing machine. I have been looking at all the beautiful and wonderful sewing machine covers out there; from images on the internet to even quilt shops that I had visited. The images struck on mind for ages, I guess I am going crazy but my sewing machine does talk to me too. She would asked me “when am I going to sew something in return of all the hard work and beautiful projects she had completed for me?” So today I’ve made this gift to reward my beloved tool that has been the centre of my happiness in terms of sewing joy and creations. From what I have observed and partly had set me back was the “complications” in sewing a cover, just too many prices of fabric panels to assemble and joining of seams. As I am rather hard pressed for time I was thinking long and hard how to make it easy to assemble and sew. I did this cover in one sitting or an evening, about 4 hours plus sewing time. My cover actually consist of only one piece / panel, fold the panel to half then sew the side of each seam. To achieve the “box” top just fold the corners (of the joined seam), draw a straight line across the corner and sew on the line. Trim off the corner after that, turn the cover wrong side and out and “walla” ! My main attraction of the cover is a piece of furnishing fabric sample I saved since years ago, I only have one piece of one design as it was bought from a furnishing shop that I happened to chanced upon while doing some other errands for the day. As I had bought some items from the store I took the chance to ask the lady who was dismantling a fabric sample book whether she could sell me two pieces. I bought it at $1 dollar! The fabric is so beautiful but there are some minor defects in terms of “runaway” threads on the surface which makes it unsuitable to make as a item for sale or swap. Hope you like this fun idea of adding some “design” to your sewing craft room and dressing up your sewing machine. The manufacturer’s cover is always so plain and just boring, having some variety is the spice of life! 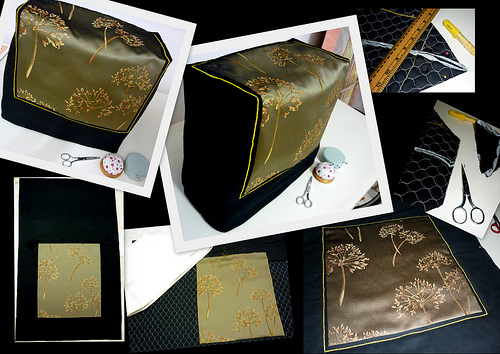 "Sewing Projects" "Sewing Machine Cover" "Sewing Machine Cosy"